Leslie Gold was an IILJ Scholar from 2005-2008. After receiving her J.D. 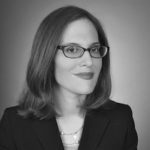 from NYU Law, Leslie began her career at Paul, Weiss, Rifkind, Wharton & Garrison LLP as an associate in the Corporate Department, focusing on transactions in the areas of Financing and Mergers and Acquisitions. She was subsequently an associate in the Corporate and Intellectual Property Departments of Morrison Cohen LLP where, in addition to her transactional practice, she worked in the areas of trademark licensing and prosecution. Leslie joined Deborah A. Nilson & Associates as an Associate in 2014.